Human Resources Management: Human Resources Management is used for addressing the employees’ aspect of this continuous improvement. It helps the enterprises in reviewing and improving their business functions related to the personnel management. Work structures represent the different ways in which employees can work within the enterprise. These are the frameworks for defining the assignments for the employees. These can be also understood as the representation of the units within the enterprise. The Business Group is the largest unit and represents the enterprise as a whole. Work structures include internal organizations (e.g. departments, divisions etc. ), payrolls, jobs, positions, grades, grading structures and the employee grouping used in the enterprise. People are the nucleus of any enterprise. Oracle HRMS gives the ability to hold information about the current employees, ex-employees, applicants, contacts and contingent workers. Along with the standard information, the system can store the information about the addresses, phones, nationality, qualifications, absence history, interview records etc. Special information can defined to store any other information for the employees. E.g. special information could be languages known or hobbies. Work related information such as preference of working hours (shifts), hours of work could also be maintained. Assignment for an employee is nothing but the employee’s place within the enterprise. The assignment gives information about the organization for which the employee works. The details about the employee’s location, job, role, position, grade, location, payroll, supervisor, working hours and loads of other information can also be obtained from assignment data. As and when the information about the employee assignment is changed, a work history is automatically built up for the employee. Assignments are also used to group people for reporting, managing and costing purposes. Compensation, benefits planning and administration could also be done with the help of the assignments. Typical data that changes for any enterprise includes corporate restructuring, employee development related changes, departmental changes etc. Using Oracle HRMS, the changes can be effectively managed without the need of redefining of the parts. These changes could be either Dated or Date Tracked. Work Structures related data is dated. Dates can be attached to a work structure to maintain the versions ad the structure changes. The previous structure can be maintained as historical data and a new version can be created with the future dates. 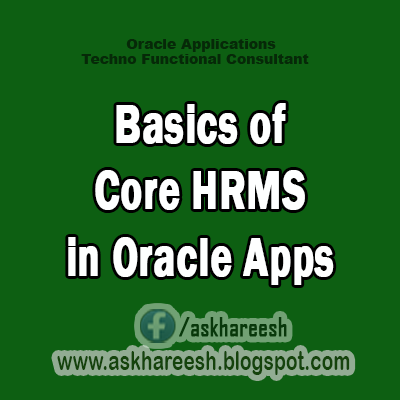 In Oracle HRMS, the information related to organizations, jobs, grades, locations is dated. The work structure is active as of a Date From, which is entered while defining it. It remains valid till the Date To. A work structure cannot be assigned to an employee before the Date From or after the Date To. The dynamic information related to the employees, employee assignments, compensations and benefits is date tracked. Date tracking is a feature available in HRMS, which is useful in maintaining history of the data when any changes are made. To view the date tracked data from the front end, effective start date needs to be set. The setting of effective date ensures that the data effective only of that date is available for the users to view, change, validate or report. When any changes are done to the data, the user can choose whether the change would be a correction to the last changes or a new update that needs to be recorded in the history. The Set effective date option is available on the screens which deal with the date tracked data. This is discussed in details in the technical section for date tracking.